Ditch The Carbs may change this policy from time to time by updating this page. You should check this page from time to time to ensure that you are happy with any changes. This policy is effective from date. We may collect certain information about you and the device with which you access the Website. For example, when you use the Website, we will log your IP address, operating system type, browser type, referring website, pages you viewed, and the dates/times when you accessed the Website. We may also collect information about actions you take when using the Website, such as links clicked. Subscribe you to the email community and newsletter service chosen by you. Provide support, education and information on any topic connected with this site. Respond to emails, repsond to enquiries. Provide updates, news, or enhancements to products sold or recommended on this site. Provide product updates, sold by this site or others, in the context of this site. Process financial transactions for goods provided by this site. Ask you to complete surveys or to enter prize draws. Deliver relevant website content and marketing to you. Manage our business and website. Help individualise content delivered to you. Help monitor the effectiveness and interest of the content delivered to you. Legitimate interest to process your data and send you marketing material is either by your consent or our legitimate interest (to grow our business). These include: Because you made a purchase from us, asked us for information about or goods and services, subscribed to our email newsletter, purchased our goods and service from a third party. You may unsubscribe from your email at any time. Every email sent from this site has a unsubscribe link which can be clicked and successfully unsubscribed at any time by you. The website uses ThriveCart, Stripe and Paypal to process payments. These are all full and comprehensive guides that I cannot fully duplicate here. ThriveCart is a platform designed to make it easy for businesses and marketers to create engaging checkout pages and deliver their products and services to you, their customer. ThriveCart are committed to protecting your privacy, and this policy explains how they collect and process personal information about you when you visit their website (thrivecart.com), when you use their products and services. To improve their website (they continually strive to improve their website offerings based on the information and feedback they receive from you). ThriveCart implements a variety of security measures to maintain the safety of your personal information when you enter, submit, or access your personal information. They offer the use of a secure server. All supplied sensitive/credit information is transmitted via Secure Socket Layer (SSL) technology and then encrypted into their Payment gateway providers database only to be accessible by those authorised with special access rights to such systems, and are required to keep the information confidential. During and after a transaction, none of your private information (e.g., credit card numbers, social security numbers, financials) are transmitted to nor stored on their servers. ThriveCart do not sell or trade your personal information to third parties. If you would like to find out more about cookies you can visit http://www.aboutcookies.org. “Personal Data” is data that allows someone to identify or contact you, including, for example, your name and e-mail address. “Anonymous Data” is data that is not associated with or linked to identify you. We collect Personal Data and Anonymous Data, as described below. Data is collected through a variety of means. You may choose to sign up for our newsletter which would require a first name (optional) and email address. Commenting on posts requires an email and first name (real or alias), and it is optional to enter your website address if applicable, which helps combat spam on the website. Third parties also track and use data, as detailed below. Cookies are placed on the website which track behaviour and allow us to build a better website by monitoring which pages and posts are more popular than others. Our website creation tool, WordPress, may store a number of cookies . Ditch The Carbs collects as little information as possible from users looking to post comments. We will typically collect a name (either real or alias), personal website, and email address. We may use the information to customise the website content according to your interests. We may use the information to measure, customise and improve our products and services. We may periodically send promotional emails about new products, discounts, special offers or other information which we think you may find interesting using the email address which you have provided. To send you promotional information, such as newsletters. Each email promotion will provide information on how to opt-out of future mailings. To track and measure advertising on the Website. Our website may contain links to other websites of interest and third parties. Once you have used these links to leave our site, you should note that we do not have any control over that other website. Therefore, we cannot be responsible for the protection and privacy of any information which you provide whilst visiting such sites and such sites are not governed by this privacy statement. You should exercise caution and look at the privacy statement applicable to the website in question. We encourage you to ask questions before you disclose your Personal Data to others. Ditch The Carbs will not share or sell your data with any third party unless absolutely required to do so by law. The exception is third-party providers that Ditch The Carbs uses to provide particular services. 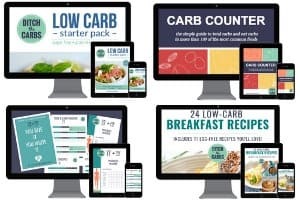 Third parties may include Google Analytics, Amazon associate codes or any other affiliate websites that use tracking data to assign a sale to Ditch The Carbs. The Website currently uses the following third-party service providers. This may be updated and reviewed at any time, so please ensure you visit this page regularly. Akismet collects information about visitors who comment on Sites that use Akismet anti-spam service. The information they collect depends on user settings for Akismet for the Site, but typically includes the commenter’s IP address, user agent, referrer, and Site URL (along with other information directly provided by the commenter such as their name, username, email address, and the comment itself). Bootstrapped Ventures, the developer of WP Recipe Maker, does not have access to any of the data collected by the plugin. This is all stored in a local database and not communicated back to us. Comments – When comment ratings are enabled they store the rating a user has given to a recipe along with the personal data WordPress core stores. IP Address –When user ratings are enabled they store the IP address upon voting. This is used as (one of the) measures to prevent rating spam. If you leave a comment, certain information may be publicly visible. You may choose to enter a name, real or an alias. Your email address will never be available publicly. At your option, you may also add an avatar, a profile description, and a link to your website. Ditch The Carbs participates in the Amazon Services, LLC. Associates Program, an affiliate advertising program designed to provide a means for sites to earn advertising fees by advertising and linking to Amazon properties. There is no additional cost to you. Ditch The Carbs uses Mediavine https://www.mediavine.com to supply and present advertising on the website. Google analytics is used to help personalise advertisements shown. Visitors can opt out of Google analytics for display advertising and customise Google display network ads using Google’s Ad Settings page. Users can completely block Google analytics tracking using Google’s analytics opt out browser add on. Mediavine has been selected as a Google Certified Publishing Partner. Only a few dozen companies worldwide have earned this honor, a recognition of their rigorous standards. Google has vetted Mediavine extensively. Ditch The Carbs takes the protection of customer data extremely seriously. Technical measures are in place to prevent unauthorised or unlawful access to data and against accidental loss or destruction of, or damage to, data. We comply with the requirements of COPPA (Children’s Online Privacy Protection Act). We do not knowingly collect Personal Information from anyone under 13 years of age. The content of this Website is directed at adults, not children. Please contact us immediately if you find a child under 13 using this Website. A number of security measures are in place to prevent any data from being lost, transferred, changed or accessed by unauthorised persons. Access to data is restricted only to those employees who need to access it as part of running this site and customer service. All data is processed and used in accordance with our instructions. We have policies and procedures in place to prevent and alert us of any data breach. Opt-out: You may opt-out of all future email communications by following the unsubscribe links in our emails. Data removal: If you have an account on this site, or have left comments, you can request to receive an exported file of the personal data we hold about you, including any data you have provided to us. You can also request that we erase any personal data we hold about you. This does not include any data we are obliged to keep for administrative, legal, or security purposes. To request this data removal, please write to. If you believe that any information we are holding on you is incorrect or incomplete, please contact us immediately. Please note that we may need to retain certain information for recordkeeping purposes or to complete transactions, or when required to do so by law.